Inside: Do you truly want to declutter, but you have almost no time? 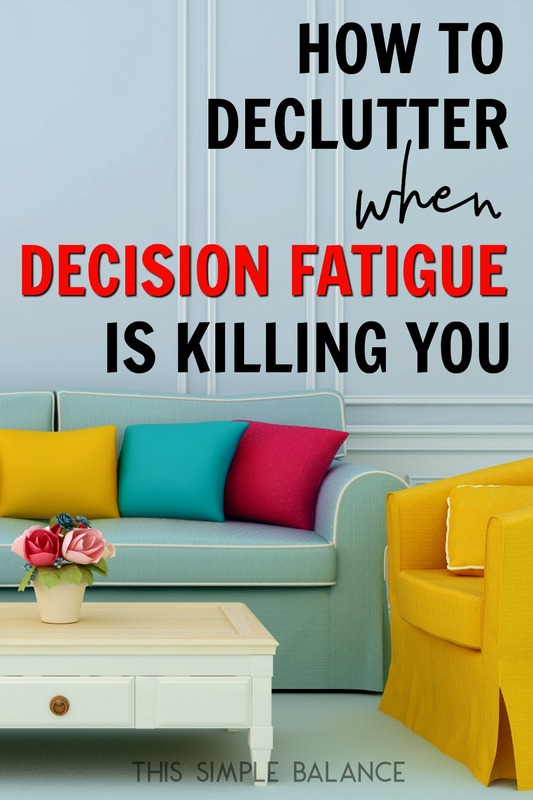 Is any decluttering time you do have ruined by the decision fatigue that comes when you’re afraid you might get rid of something you’ll need in the future? Then this decluttering guide is for YOU. Decluttering takes time and effort. It’s something you need to decide you really want to do. It requires a strong commitment and careful prioritization. All of those statements are true. That being said, so many of the women I talk to are moms with young kids and bigger than average families (i.e. more than the 2.2 kid American family average). They also work from home, homeschool, or both! If that’s you, I absolutely believe you when you say you want to declutter – you really do – but time to get the job done is a very real roadblock. Some might recommend dropping your kids off at a grandparent’s house for a few hours a week, but that’s also becoming less of an option these days. Not everyone moves back home to be close to the grandparents when they start a family. And even if you did, odds are high that a job change will move you away from family at some point. We just don’t have the same support systems older generations had. Who wants to spend babysitting money on time to declutter? I sure don’t! We rarely pay for babysitting, but when we do, we use that money for a long overdue date night. 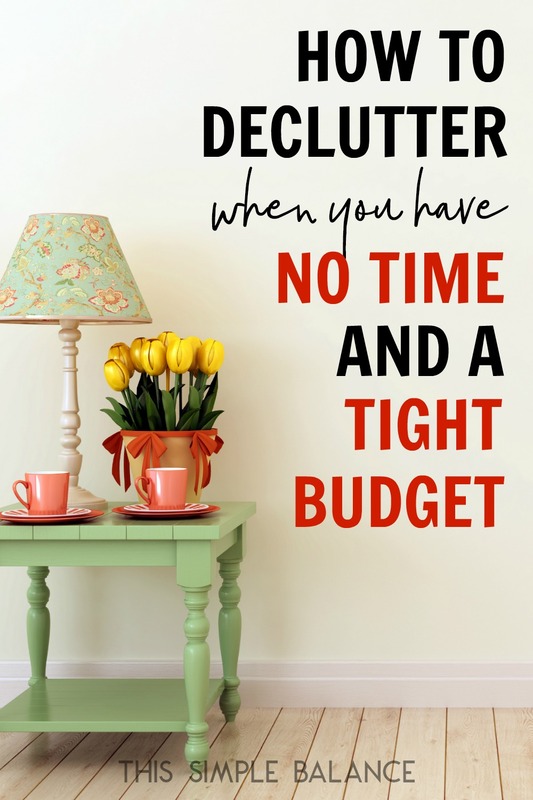 Add a lack of time to a tight budget, and you start hitting even more intense decluttering roadblocks. When you have a tight budget (and have most of your life), getting rid of stuff you might need someday becomes more challenging. You are, for good reason, nervous that should ever need to replace your decluttered items, you won’t have the extra funds to do so. One interesting side note: my husband just informed me that certain personality types will also struggle to give away things they think might be useful one day. The Strength Finder’s personality assessment shows that having the strength “Input” might make it more difficult for you to get rid of stuff. Typically, people with “Input” are born with a strong drive to gather information and to file that information away for later because it might be useful one day. The same drive can apply for gathering and filing physical objects, but only what that individual deems useful. The good news is that even with all these obstacles, you can still declutter! The classic decluttering advice probably won’t work for you. You’ll need to take a slow and steady approach – with a twist. 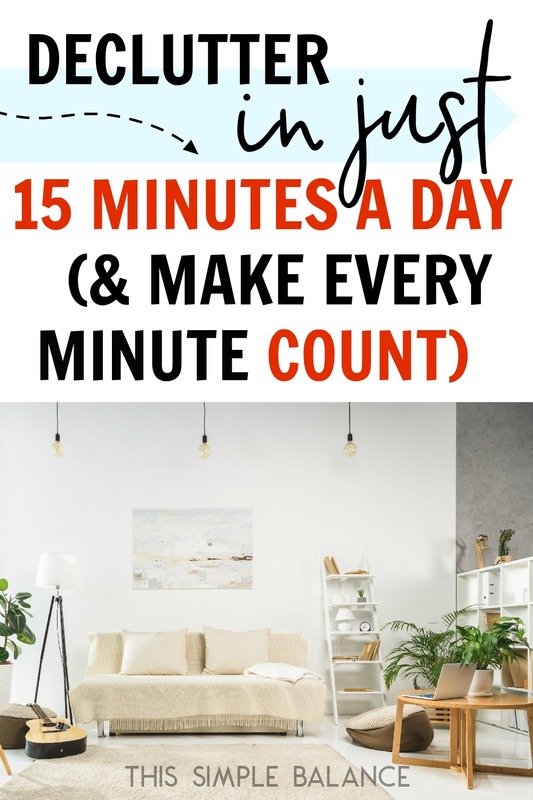 But first, let me explain the drawbacks of this approach (and why the “declutter your house in a day” is so popular and my preferred method). Before you officially start decluttering using this method, you need to know about the drawbacks to this approach. 1) Clutter can come into your home at the same rate it leaves your home. That’s why many minimalists – including me – will encourage you to keep the majority of your surfaces clear. There’s something about an object on a surface that’s so friendly and inviting! It almost audibly beckons you to put down your glass, or that bill you need to pay, or your purse, or the book you need to finish. Pretty soon the clutter is indistinguishable from what actually belongs on that surface. But post-decluttering? After all that time and effort, you become ruthless about what you allow to come into your house. When you take the slow and steady approach, you need to become ruthless before the initial decluttering job is complete. Otherwise, you’ll simply be trading clutter for clutter. 2) It will take much longer to experience the full benefits of decluttering. When you take the slow and steady approach, you need to be even more focused on your “why”. Because it will take longer to reach that moment when you look around your home and breathe a deep breath of satisfaction, you need to know what you’re aiming for. What’s your big goal that’s driving your decluttering? Why are you doing this? When decluttering takes longer, you are more likely to experience setbacks. Started decluttering in early November? Here comes Thanksgiving and Christmas to bring an influx of clutter! Your desire to achieve your end goal needs to be bigger than the inevitable setbacks that will come when you take the slower route. 3) Your storage space may get a little crowded. My unique strategy when decluttering on a lower income involves holding onto things longer than the average minimalist recommends. You’re probably going to have more than a few boxes to keep in storage until you are ready to part with those items. Now that I’ve told you about the drawbacks, if you are still saying, “But June, I really have no time! I just can’t do the decluttering sprint,” you’re going to want to pay close attention because there’s hope! Follow these five steps to get the job done, time or no time. 1) Define your why, and set a goal end date. You really need to know why you’re doing this. Why the heck are you putting in all this time and effort? Maybe you want to have more time to spend with your kids. Maybe you want to not feel stressed and overwhelmed the second you set foot in your house. Maybe you want to be able to have time for a hobby. Whatever your reasons, you need to remember your why. Sometimes, visuals can help. Write out your end goal, tear pictures out of magazines: put all of these up where you can see them. You also need to sent an end goal. This isn’t a hard and fast rule, and it isn’t meant to discourage you if you don’t make it by that goal. 2) Divide your house into clear zones. Zones are typically entire rooms. However, if you have rooms serving 2-3 different functions, break up those rooms into zones. For example, a living might also function as an office. The dining room and kitchen may be one room technically, but they could be considered separate zones. 3) Decide where to start decluttering. While I generally recommend starting with bathrooms because the rooms are small and can be completed relatively quickly, if you are really pressed for time and decluttering is going to take longer than 30 days, you are going to want to start in the room that matters most to you. What room, when completely decluttered, will make you feel amazing? What room would you love to be your happy place? Which one would you love to be ridiculously easy to tidy (less than 10 minutes)? Choose one room, and start there. Put the other rooms in order of priority after that. 4) Crush decision fatigue with two boxes for clutter. One of the biggest problems with only doing 10-15 of decluttering a day is getting stuck in decision-making: what to keep, what to get rid of? Will I need this a month from now? If you haven’t used the item in 4-6 months (and it’s not seasonal, like Christmas or Easter), it goes straight into the “wait-and-see” box, no debates, no questions, no waffling or wavering. Staples paper boxes are perfect for this if you can get your hands on some. If not, diaper boxes also work well. No kids in diapers? Ask friends who do: I’m sure they would love to get rid of them! Make sure that the “wait-and-see” box only contains items from one room or area. That way, if you do think of something you needed, it won’t be difficult to find. I honestly don’t expect you to remember much of what you put in this box. Then again, I have a 4-year-old who still remembers two very specific toys we had to get rid of (there was literally no more room in the pod) when we moved two years ago. So…maybe you will? But the majority of things you haven’t used in 4-6 months, you really don’t need in your home. It’s cluttering your living space in the name of “just in case” or “what if I need it”. For example, we own a food processor because my husband is an idea person who gets on crazy obsessive kicks. He asked for one for Christmas a few years ago so he could make homemade salsa. We used it for about a month…and then the kick ended. I held onto it for a couple years, though it got moved to storage because our kitchen here is so much smaller. I knew there were all these other uses for food processors, but every time I thought about using it to make cooking a dish just a tiny bit easier, I thought about having a clean it. In storage it stayed. My husband *finally* gave me permission to sell it. It served a purpose for a month, and we just don’t use it anymore. Once one of your “wait-and-see” boxes are filled up – or you’ve moved on to a different room – clearly label it WITH today’s date, and put it in storage. Caveat: The more you can put in your “Give Away” boxes, the better. You’re going to have to deal with that stuff sooner or later, but I’d rather you move more quickly through the decluttering process so you have all the motivation you need to part with that stuff in a heartbeat later. 5) Work your way through your room list in a systematic way. In The Life-Changing Magic of Tidying Up, Marie Kondo recommends gathering all the like items from your entire house together and decluttering that way. If you’re doing a decluttering sprint, that might work for you. For our purposes, you’re going to gather all the like items from your chosen room. Tackle one group of things at a time, one day at a time. Some categories might take multiple, 10-15 minutes sessions – like books (see this post for specific help decluttering books). But even books can be tackled be individual shelves. Resist the urge to pull every book off the bookshelf when you don’t actually have time to deal with them all. You’ll make a bigger mess than you started with, get discouraged, and give up. And that’s NOT what we want! After you finish your living space, you are going to need to deal with what you put into storage (how to deal with existing storage is another post entirely). If you can get rid of them earlier than six months from the date listed on the box, do it! Sometimes all it takes is that first few weeks of feeling safe – knowing you still have whatever is in them in case you need it – and then, magically, you are far more confident in your initial, fast decisions. Get them out of there! If that’s not you, I recommend not dealing with your boxes until six months from the date listed on the side. It takes about six months to realize you don’t really need or want what’s in them. When you reach six months, I’m going to ask you to do something that takes courage: donate the box without going back through the contents. If you haven’t missed them or needed them by now (again, unless they are seasonal items), I can say with *almost* one hundred percent certainty that you don’t need or want them. Avoid all of that, and drop them off unopened at your local thrift store, instead. Trust me. Personally, unless it’s kid or maternity related, 99% of the things I declutter I know I won’t need two years from now if I haven’t missed them in six months. During my decluttering process, I did keep maternity clothes that were in good condition and I actually wore during my pregnancies (and will you look at that! I’m wearing them again now), baby things such as burp cloths and car seat covers, and hand-me-down clothes for my boys. In contrast, by the time I knew I was having another baby boy during my fourth pregnancy, I realized keeping my oldest’s girl clothes wasn’t worth it, even if we did end up having another girl. We’ve already found hand-me-downs for this baby girl : they aren’t hard to come by from friends or Facebook Buy/Sell groups. You just need to trust the process and believe that the benefits of living in a clutter-free space is worth possibly needing a few items one day in the theoretical future. In my five years of decluttering, I’ve regretted maybe five things. I didn’t replace most of them – I learned to live without, and the one or two I did weren’t expensive to replace. If at all possible, I recommend decluttering at the speed of light. When I made the choice to declutter, I had three small children, but some kind of crazy focus and ambition came over me, and I decluttered like a boss. I didn’t have a babysitter (other than the good old TV). I probably didn’t cook dinner for a week. But I decluttered. I think it took 4-5 days. Afterwards? My house felt SO good. I could breathe again. I wasn’t cleaning up all.the.time. If you can dig deep down and find that sort of wild-eyed, crazy focus and drive, do it! If not? I totally understand. We’re all built differently, and some of us don’t have this constant drive or energy to achieve. I just wanted to give one final pitch for the “declutter your house in a week” approach (I used this book to guide me, but I now recommend this book instead. The first one is perfectly fine, but the second is better in my opinion for families and people decluttering on a low income). Commit to 10-15 minutes of declutter every single day until the job is done. Your decluttered home will be so worth it. Promise. I’m so happy I found you. We would probably be really good friends if we were to meet (I have three boys, age 4 and under, and a 11 year old step son – and I want to homeschool my little guys, oh and start a home business.) I’ve wanted to declutter for a very long time (I bought my parent’s home and with it came a bunch of their stuff, plus mine and all my kiddos) but it is very overwhelming. I have three small kids. My conflict is that if I declutter, I feel the need that I need to try and sell this stuff and not just give it away. Some things are worth a chunk of money. However, because there is so much stuff, it’s overwhelming to even begin. I don’t know what to do. I feel like the easiest way to have the life I want, it to just pack it and drop it off, but I feel guilty about not trying to sell stuff. Any tips? I hear you Sarah! I try to prioritize which items I know will sell. For example, we sold my husband’s punching bag on Facebook Marketplace and a few kid’s items in good condition that I knew would sell quickly. (the punching bag sold in a day). I would only take the time to list things you know will sell (typically furniture, kid’s clothes in lots or winter coats/boots, baby stuff – swings, cribs, seats, etc., electronics in good condition do best). Set a limit to when you will donate if not sold. If you think other things are wanted, but would have a hard time selling AND you have time, list them for free – better to get them directly in the hands of someone who wants it than at the thrift store where it might end up in the landfill anyways. If you have limited time, I would then drop other stuff off at the thrift store if it’s in decent shape. In the past, I’ve droppped stuff off I probably should have just thrown away, but oh well. Also, with kids that young, I understand the need to just GET IT OUT. Don’t feel guilty. Just commit to be a better consumer in the future. Best to you in your decluttering journey! It’s worth it! Carrie! I’m so sorry – sometimes I forget to add those links. The first book – the one I used – is this one, and the second is this one. I’ve added the links into the post as well for everyone’s benefit. Thanks so much for pointing that out, and I hope these are helpful! Which books do you have in mind here?